Young-at-Heart - Bringing it Home. 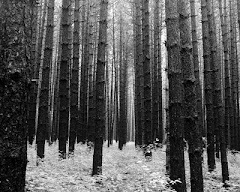 When I was a little kid, I was in the woods a lot. Don't get me wrong, I watched cartoons, played a good amount of video games, and had my nose crammed in books the rest of the time, but nothing made me happier than disappearing into the woods for hours and letting my imagination take over. Now my imagination at my age isn't as great as it was back then, though having a seven year old does help a lot. I find that trail running and hiking are by far the best activities for me to get back to that carefree kid mindset, even for a few hours here and there. I think that might be a lot of what we all long for, is to put all those adult stresses on the back burner for a little while. 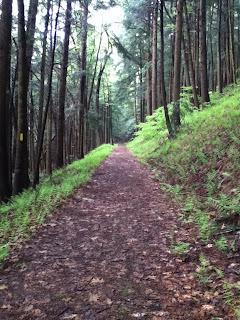 When I'm running down a trail, my mind is on the trail, avoiding a root, making my feet land in the surest looking spots, avoiding smooshing any critters on the trail, and just letting my skin and mind and being take in that world around me. And knowing that it's still out there, going on without me, the woods, doing its thing, going on so next time it will be in some different stage of life... well it makes coming back home and rinsing the dirt and leaves down the drain not as bad, because I was there and part of it for a little while, and I'll go back and be part of it again, soon. 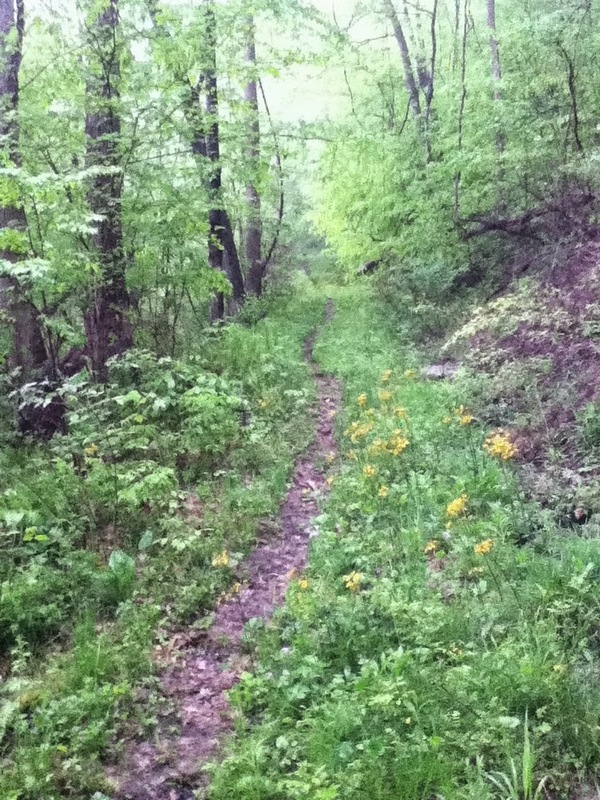 So today, twenty three miles of trail around Oil Creek state park. Places on the trail become like photographs; they make me remember things that happened there in the past. I saw a porcupine on a tree. My dog was covered in burrs under some pines years ago. I fell there. And there. Oh and there too! It's nice to have a living photograph to go back and visit. 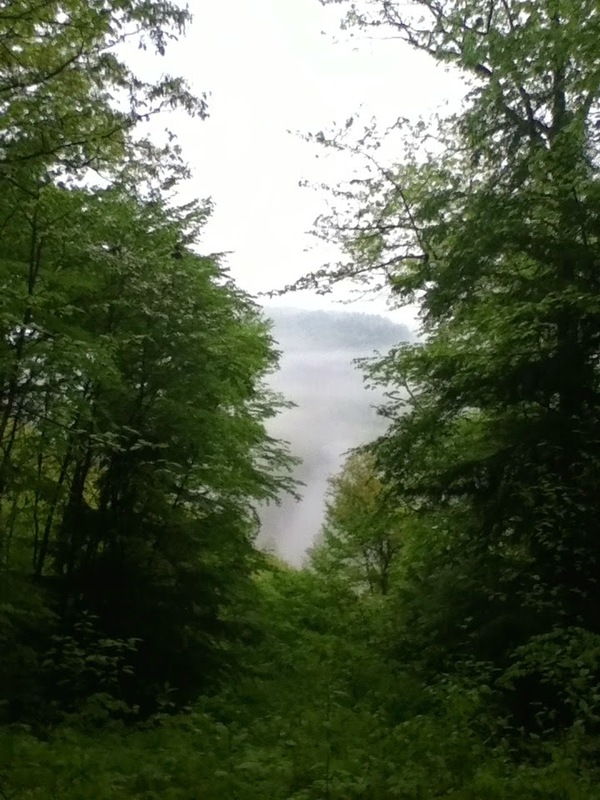 The fog in the morning was thick. This is the overlook above the Wolfkiel switchbacks, and you normally can see the Miller Farm bridge down there. Not today! 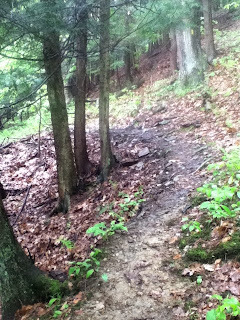 This is the beginning of a really long hill not to far from the switchbacks. The nice thing is, it ends near a "magic" bus (someone's old hunting camp), and some really nice big rocks. The next overlook wasn't quite as misty, but still hard to make out Oil Creek below. 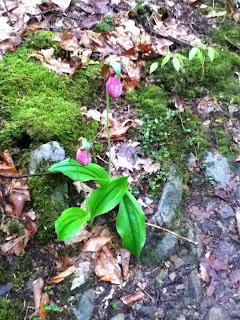 Lady Slippers blooming near the Pioneer stairs. The stairs lead to a split in the trail and a small parking area. I saw lots of flowers on my run, but I'm not so good at identifying flowers. Overlook before the last long descent before Petroleum Center. You can barely make out the bike bridge in the fog. The beginning of about a mile long descent, I think it's my favorite on the trail, but I found a few on the 8 mile Wildcat Hollow loop that I'm going to have to explore a bit more. I'm open minded about favorite downhills. I'm fond of them all! It started sprinkling as I came through this marshy section near the road I would cross to start into Wildcat Hollow. The first very long uphill leading into the Wildcat loop. It's amazing how green everything became in less than two weeks. The rain was getting harder, and the mist was thicker. 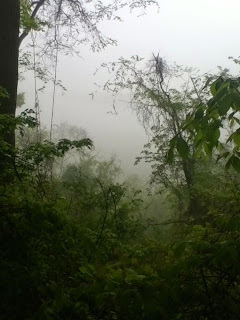 When it's so foggy that I can't see, I sometimes like to pretend that I'm somewhere more exotic, like Bolivia, or Thailand, or Mercer (just kidding!). I guess it's that kid in me. Rainy field. The rain was really pouring at this point, but the temp was warm, the rain was cool, and I didn't mind it. 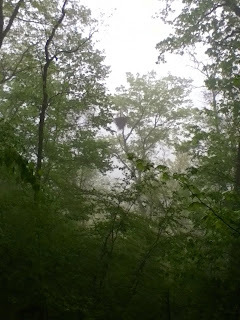 Eagle's nest in the mist. I think I could make out a head poking out, but I didn't linger so that I didn't upset the kids or parents. More mist - a bunch of deer jumped out at me right before this point, I think with the noise of the rain, I got a lot closer to the deer that I startled than I normally would have. Fortunately I didn't surprise any bears the same way... well fortunately and unfortunately, because I do want to see more bears during my wanders, just not too close. 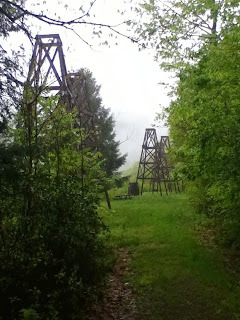 This southern most 8 mile loop from Petroleum Center to Route 8 and back has the most oil boom relics in the park. 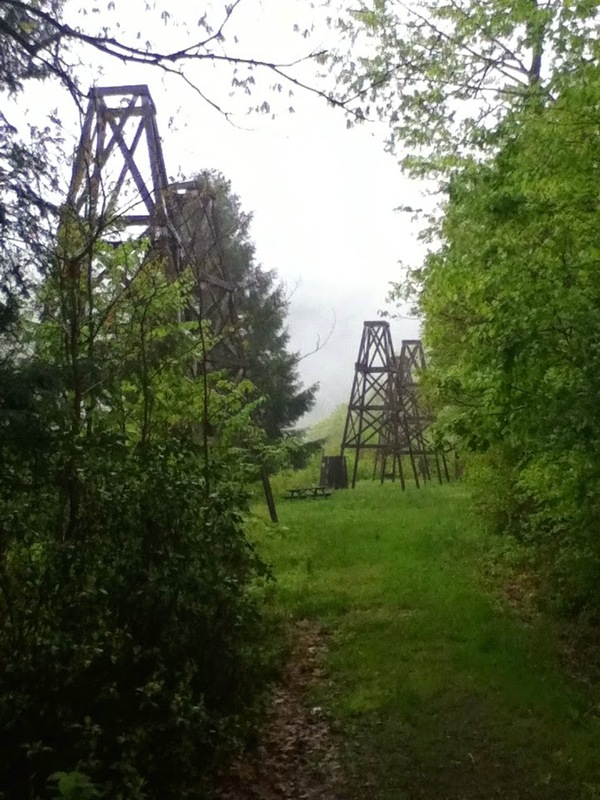 Lots of barrels, old wells and machinery all along the trail. Once again, it makes me wonder at nature, that it can come back from being stripped down to what it is today in a little over 150 years. 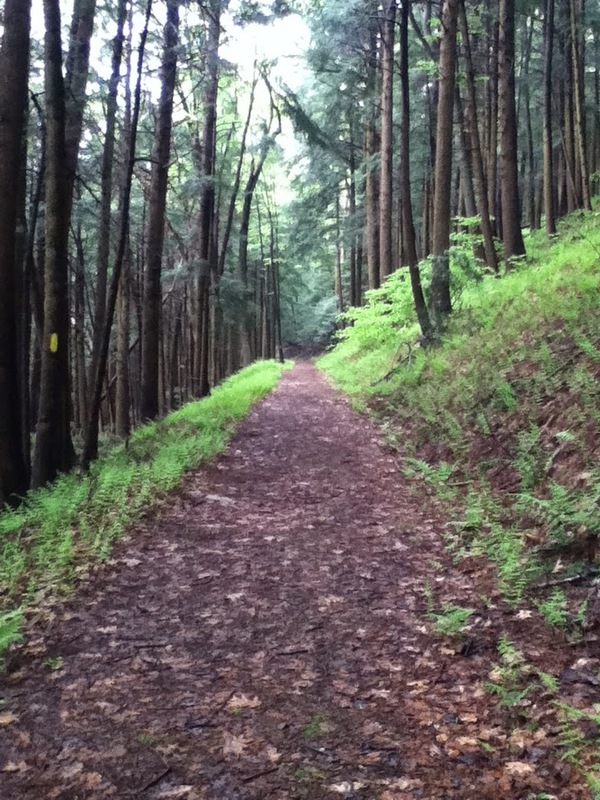 It's pretty amazing to think about when you're running along the lush trails. It was fun to run through the tall wet grass. 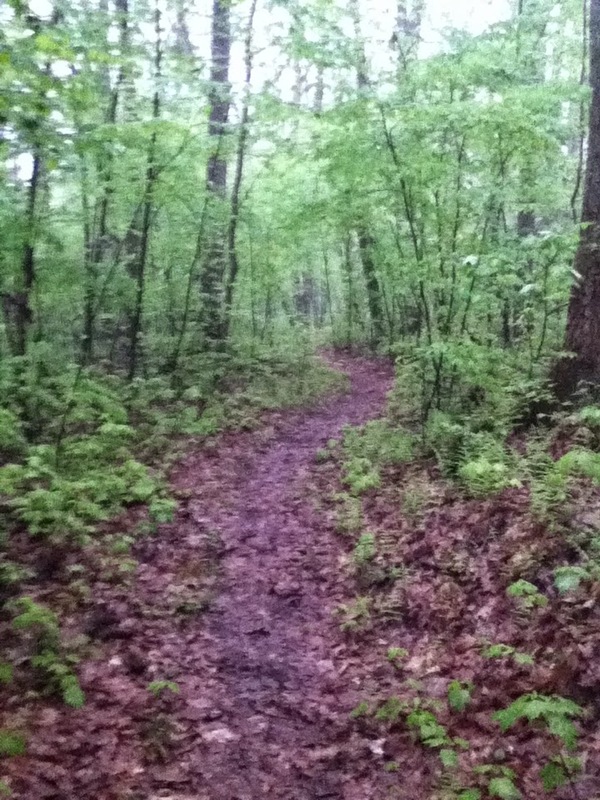 It was very pretty, and I did check for ticks after. 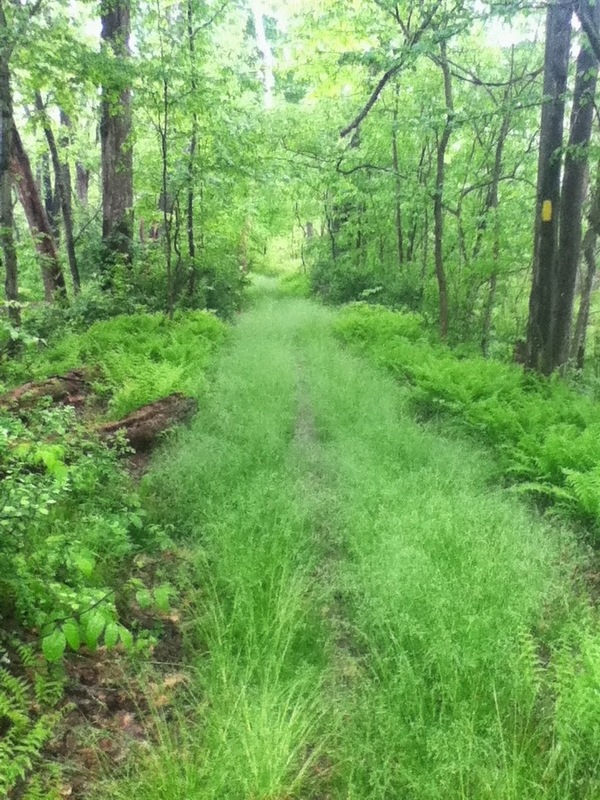 There's something inviting about a grass lined trail. 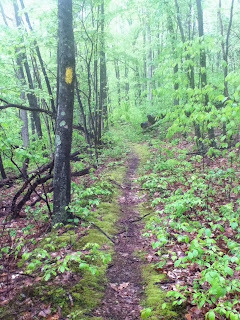 I've only run in the Wildcat loop a few times, but I really love this mossy section. Very nice on the feet. 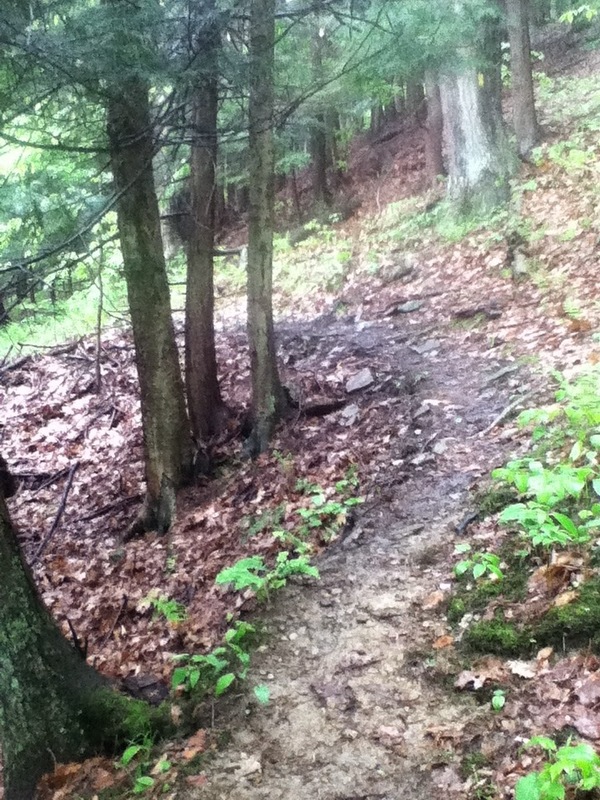 Some of the trail was a little crumbly in sections, made a little worse by the rain and mud. I went carefully, with no mishaps. In fact, I didn't even fall once during my run yesterday. Oil Creek flowing nicely with all the rain. The rain had pretty much stopped by this point, and I was drying out a little. I was so glad I chose to wear my contacts and not my glasses. It would've made for a very blurry run. 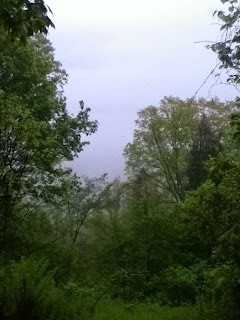 Though the rain had stopped, it was still pretty foggy in the woods. I was coming back down into the wetter low areas towards the creek and getting closer to PC, and the skunk cabbage became more prolific. 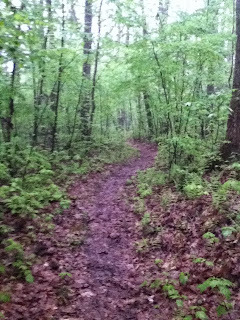 The trail wound through the skunk cabbage, and I think I scared some frogs and toads as I ran through. So I made it to Petroleum Center, filled up my water bottles, took a little break to eat some dried cranberries, and headed up the hill into the last part of the day, an eight mile section that would get me back to my car. 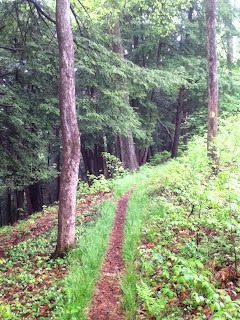 I took my time up the hill, and this lovely part of the trail is at the crest of the hill right after the sign-in box. A very runnable portion of the Gerard trail. 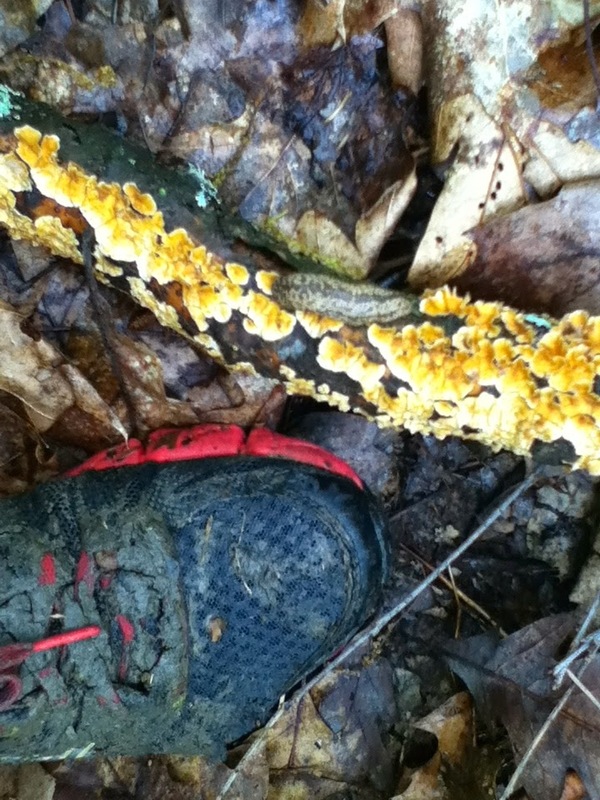 There were a lot of these guys out on the trail. I moved a bunch of them off the trail, and I may have talked to each one of them too. Ahem. The outside of my left shoe was much worse than I thought it was. 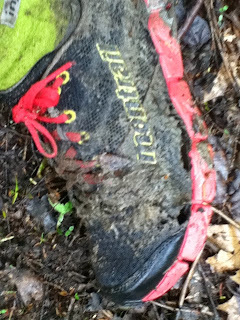 I was worried the entire run that I was going to slip down a muddy slope and rip the side right out and have no support on the outside of my shoe. Luckily it held out, but as you can see, it's ripped out at my pinky toe and then back down the outside of my foot. I think these shoes have 2 months / 160 miles on them, maybe? One of my favorite spots in the park. I remember hiking here years ago and falling in love with it. Not that I don't fall in love with most of the park. I fall in love easily, and I fall hard. Kind of like trail running. Fall easy, fall a lot. It's good for the soul and makes you tough! Now I'm confusing myself. This picture didn't come out as well as I liked, but this little red eft was all coiled up in a corner on the base of a tree, and looked like a mini dragon guarding his hoard of leaves. There were a lot of lady slippers out on the trail this year. More than I can remember. I even saw a couple of white ones. These were on a section of the trail that I always say looks like you're out west, because of the pines and the rockiness of the trail. It's about a mile before you reach the Cow Run camping area. Right after I filled my bottles up at Cow Run (they weren't empty, but I topped them off), I heard these guys. Ravens! There must've been a family of five or six of them, calling to each other with gravelly voices, much rougher than a crow. And I'm embarrassed to admit that I may have mimicked them for a good 5 minutes, and this one kept coming back to look at me. Larger beak, rougher voice, definitely ravens. Very cool that we have a family living at Oil Creek. Heading up the beginning of the last hill, I saw this GIANT slug! Leopard slug. Makes sense I guess with all the spots. The fun things you find when running in the rain. Millepede. I know. I love critters. When he started chewing on my hand, I let him go, gently. I rinsed my feet in the cold water for a few minutes before heading up the last rise before the final downhill to Miller Farm road and my car, where I stashed a Dr. Pepper to reward myself for a run well done. The last bit of trail down. I ran easy down it, but overall, my legs still felt pretty darn good after twenty plus miles. I can't wait to get back to the trails again!